Mix the flour, semolina, ghee and sufficient water to knead into a stiff dough. Roll out the dough into thin round, then cut out 1-inch rounds (use a bottle screw cap). Cover with damp cloth. Fry the rounds, a few at a time, until they are puffed up and light brown all over. The puffing process is helped by placing a spatula or karchhi in the middle of the pan and moving it gently to make waves in the oil. But be careful, oil should not spill out or on you. When cooked, place, with great care, on absorbent kitchen paper towel to drain. Boil the tamarind in water till soft. Squeeze the tamarind and then strain. Now add salt, cumin powder, chili powder, pepper powder and chopped coriander to it. Make a hole on top of each puri. Fill each puri with a 2-3 chickpeas and potatoes. 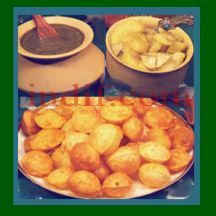 Dip the puri into the paani and serve immediately or it will become soggy. The paani can also be served in a separate container.